Soputan volcano, on Indonesia's Sulawesi island - the very same that's just been afflicted by a powerful earthquake and devastating tsunami - has just erupted. According to the Jakarta Post, Mount Soputan in North Sulawesi's Minahasa regency emitted a 4-kilometre column of ash on Wednesday morning around 8:47 a.m. local time, or 7:47 a.m. Jakarta time, prompting authorities to raise the volcano's status to Level III (alert) of the four-level national volcano alert system. 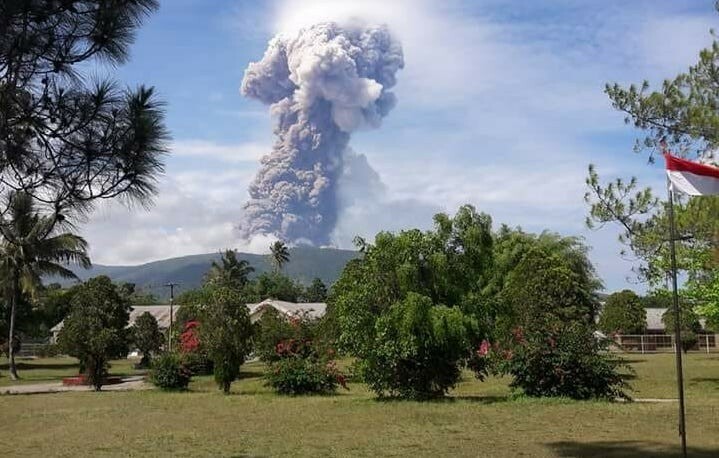 The Center for Volcanology and Geological Hazard Mitigation (CVGHM) has advised local residents to refrain from entering the area within a 4- to a 6.5-kilometer radius around Mount Soputan. Residents of riverbank settlements near the mountain – those on the Ranowangko, Lawian, Popang and Kelewahu rivers – were also warned of the potential for lava flows following rain. "This means that the volcanic ash will not disrupt flights. Sam Ratulangi International Airport in Manado is still operating normally, as it is located southeast of the mountain," it said in a statement. Details remain sparse, and there's no official comment from Center for Volcanology and Geological Disaster Mitigation (PVMBG) just yet, but from reports on social media, it appears to have created a large ash column in an explosive blast sometime in the morning of October 3rd. Indonesia's volcanologists just a few hours ago had been warning that the stratovolcano had been showing signs of restlessness. I explained at the time that despite these signs, predicting exactly when it would erupt and how was not possible. Saying that, the changes that were afoot at the volcano did appear to mean that, as the PVMBG put it, "the potential for an eruption at Soputan has increased." In this case, it seems that the scientists were bang on the money: just hours after an exclusion zone around the volcano was put in place, it appears to have blown its top. Again, it's not clear how this eruption will unfold in terms of its behaviour, how long it will last, and how dangerous it will be. Potentially dangerous to those living around the volcano, any eruption will be affected populations that aren't the same as those directly impacted by the tsunami, although the same may not apply to the earthquake-hit population; it's difficult to say at this early stage. Please check your sources carefully, and don't spread any misinformation. And no - the earthquake didn't trigger the volcanic eruption; it was gearing up for something for several weeks now.